Skoda has unveiled its latest concept car, the Sunroq, based on the Karoq SUV. The car, a roofless version of Skoda’s small SUV, was designed and built by 23 students aged 16-20, who are part of the Skoda Vocational School. From its initial concept, the car took eight months to finish. One of the only rules of the project is that the car has to be based on an existing Skoda model. As you can see, quite a bit has been changed from the Karoq. The pillars have been completely redesigned, along with the back end – which gives it a bigger boot than the production Karoq – and most obviously, it no longer has a roof. At all. The exhaust system was also overhauled, to naturally, make it noisier. Some existing features on the Karoq have been subtly altered. The logos are now luminous (shows up much better in the dark), and the indicator light patterns have been re-programmed. At night, Skoda logos are projected onto the road from the front and rear bumpers. What has remained is the Karoq’s length, width and wheelbase, although it sits lower to the ground thanks to the use of shock absorbers from the Skoda Octavia RS. The car uses the same 1.5-litre petrol engine from the Karoq too, with 163 horsepower, and a 0-62mph time of 8.6 seconds. 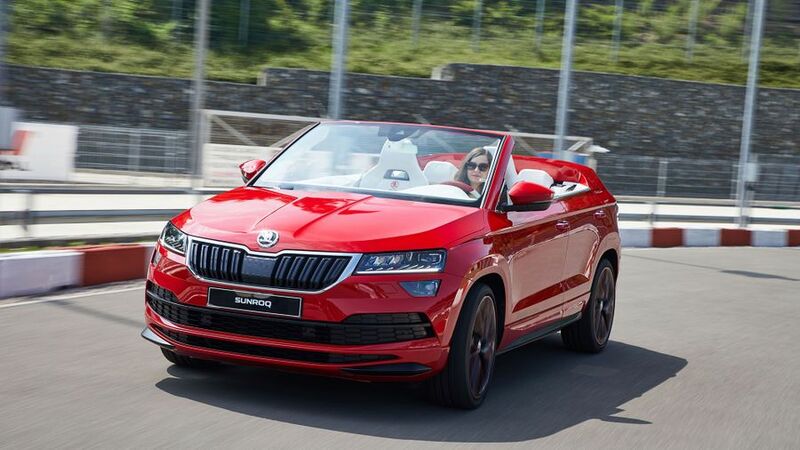 The Sunroq is painted in Skoda’s ‘Velvet Red’, with white and red leather interior. The finish is pretty high quality, although the only thing that seems to have been put in as a bit of an afterthought is the seatbelts, which you have to pull upwards through the door. The students said the car has been designed for a young adult who can carry their surfboard with them, while feeling the wind in their hair in pursuit of adventure. To take part in the project, each student had to submit sketches for a car they wanted to build. After the team was finalised, they got together to agree on one design. 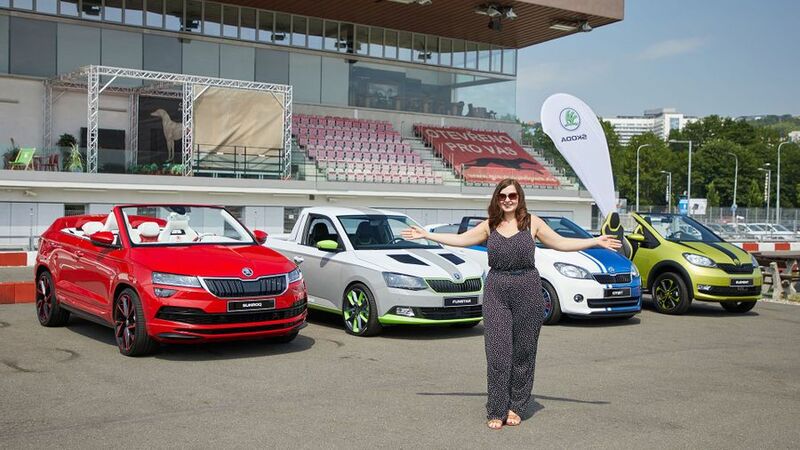 During the design and building phase, they worked with teachers, and Skoda employees from the technical development, and design and production departments. The cars have gone through all the usual testing that a Skoda car would go through, including aerodynamics and performance – hitting the car’s top speed of 121mph. As it’s a one-off, it obviously hasn’t been crash-tested though. To come up with the name, the students took to social media and asked Skoda fans and customers. Instead of the usual ridiculous suggestions, they chose the rather sensible Sunroq. This is the fifth year Skoda has done its Azubi car project. The first one in 2014 was the two-seater Citijet, based on the Citigo. The 2015 model was a pick-up based on the Skoda Fabia, the 2016 car was the Atero coupe, based on the Rapid Spaceback, and the 2017 car was the all-electric Element, based on the Citigo. For the project, the students take on the roles of designers, engineers, and work in mechatronics, paint, logistics, and marketing to bring the whole thing together. They also get the chance to work with Skoda board members throughout the project. It’s really interesting to see what common traits the cars have from year to year. Personalisation is a big one, along with bright colours, an impressive soundsystem, a noisy exhaust, and lots of LEDs left, right and centre. Head of the Skoda Vocational School, Martin Slabihoudek said many of the students involved in the project will go on to work for Skoda across all areas of the business, and that the Azubi project is a great chance to find out more about Skoda, and get time with the members of the board. So, if you’ve got your eye on a convertible SUV, a pimped-out Citigo, or you really love LEDs, your wish might just come true in a few years‘ time. Interested in buying a Skoda Karoq?